My day job involves managing a bakery cafe for Panera Bread. We had, for a long time, a huge sandwich called an Italian Combo – It was, frankly, completely pedestrian – cold cuts, cheese, veggies – been there, done that, t-shirt is an oil rag… I was personally thrilled when that lead weight was replaced with a really good version this fall – With wine salami, hot sopressa, aged provolone, house made basil mayo, and a nice layer of Giardiniera, the King of pickled veggies, on a fresh baked hoagie roll – that’s a damn good sandwich, indeed. And that got me thinking about that giardiniera, (Jar-dhi-nare-uh), a pickled vegetable mix, either done up as bite sized pieces or a relish. Redolent of fresh veggies and good olive oil, wrapped around lip smacking brininess that rivals a great cornichon – This is something we all need to be making at home. Pickling foods to preserve them hardens back thousands of years and crosses numerous boundaries – almost every society does and has employed it. 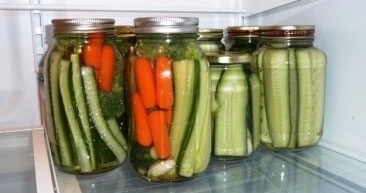 Everything from veggies, to meat, fish, fruit, nuts, and even eggs can end up in the pickle jar, much to our advantage. Pickling not only helps preserve things through the dark months, it adds a vital zip to what can otherwise be a rather bland time of year. Giardiniera hails from Italy, and means literally, ‘from the garden, (also called sottacetto, or ‘under vinegar.’) While variants come from all over the boot, the versions we’re most familiar with has southern roots, down where the mild Mediterranean climate fosters a wide variety of veggies, the best olive oil, and great sea salt. That’s where those colorful jars filled with cauliflower, carrot, olives, onions, peppers, and chiles hailed from. You’ll likely find jars of the bite sized version of giardiniera in your local grocery, with the fancy olives and other pickled goodies. While some of the commercial stuff is pretty good, none of it can match what you can make at home, and to top things off, it’s remarkably easy to do, (And frankly, the relish version of giardiniera is much more versatile, and rarely found in stores). Seasoned with fresh herbs, maybe even touched with a little hot chile flake, giardiniera is fabulous on sandwiches, (including burgers and dogs), pizza, salads, and as a table condiment with more dishes than you can shake a stick at. Now is the time to be doing up a few batches of your own – it’s fairly traditional for giardiniera to be made in the fall, as a catch all for all those late season veggies we don’t want to lose to the first frost. The American home of giardiniera is Chicago, where that famous Italian beef sandwich hails from. Slow roasted beef, cooked over its own jus, sliced thin and slapped onto a nice, dense roll, ladled with a generous spoon of giardiniera, a little jus, and eaten in the classic sloppy sandwich hunch – a little slice of heaven. Making giardiniera is a real treat. Your first and foremost issue, naturally, is what to put into the mix. The blend I outlined earlier is generally recognized as the classic base mix, but pretty much anything goes, (I should note that peppers and chiles were not in the original Italian versions of the dish, as they didn’t show up in European cultivation until the 1700s.) firm veggies, like carrots, celeriac root, turnips, cauliflower, broccoli, and asparagus do well. Peppers and chiles will do well too, though really soft stuff like tomatoes tend to break down quickly. Making giardiniera couldn’t be easier. While some recipes call for cooking or fermenting, (both processes are perfectly fine), the simplest version is, for my mind, best – Just brine your veggie mix for a day or two, until you reach the degrees of zip and bite that you like, and that’s it. 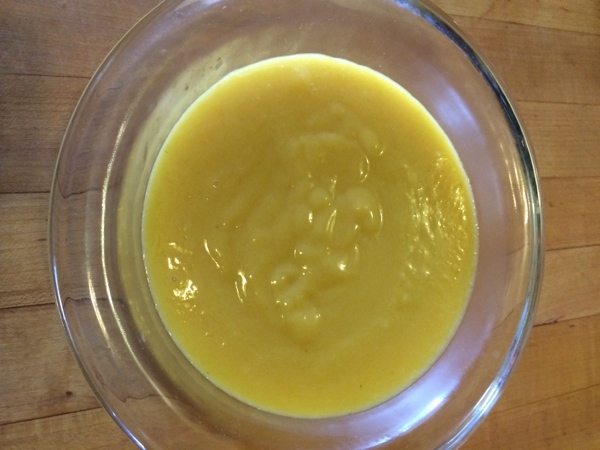 You’ll find recipes that call for the mix to be stored in brine, oil, vinegar, and a simple vinaigrette – My money is in the latter option – that will provide a nice stable medium, and a great taste as well. There are typically mild and spicy (AKA Hot) versions, and extensive regional variety, like the Chicago style that includes sport peppers and an accompanying degree of heat. Down south, the version that goes with a muffuletta sandwich is mild and heavier on the olives. Those are great, and worth your time to build, but really, look upon giardiniera as a launching pad for creativity – You really can’t go wrong if it’s made with stuff you love – For instance, I didn’t have celery when I made up the relish version, but I did have fresh celeriac root, and it turned out to be a wonderful substitution. You can use any oil and vinegar you like for the base vinaigrette. Seasoning can be as easy as good salt, olive oil, and vinegar. When you feel like adding additional spices, be conservative in both number and ratio – The rule of three is a good thing here. Unless you process your giardiniera in a hot water bath, keep in mind that this is basically a fridge pickle. If made carefully, and packed into sterilized glass jars, it will last a month or two refrigerated. Just keep in mind that they’re not shelf stable unless you go through the canning process. Accordingly, what we offer below are small batches that will make a couple of quart jars of finished product. There are cooked and fermented versions out there, and we’ll leave those for you to explore. Stem, seed, and devein the peppers and chiles, (leave the veins in the jalapeños if you want more heat). Cut all veggies for the base mix into a uniform fine dice, about 1/4″ pieces. It’s not important to be exact, just get everything about the same size and you’ll be fine. Transfer the mix to a glass or stainless steel mixing bowl. Cover the mix with fresh, cold water with an inch or so to spare. Add the pickling salt and mix with a slotted spoon until the salt is thoroughly dissolved. Cover with a tight fitting lid and refrigerate for 24 hours. 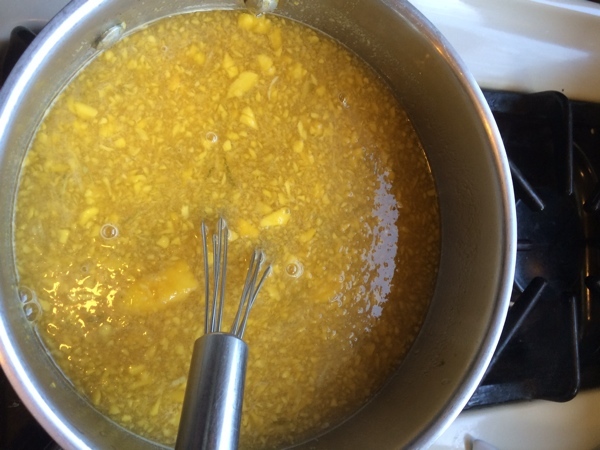 After 24 hours, take a spoon of the mix out, gently rinse it under cold water for a minute or so. Test the degree of pickle and softness of the veggies. If you like what you’ve got, move on – If not, give it another day. 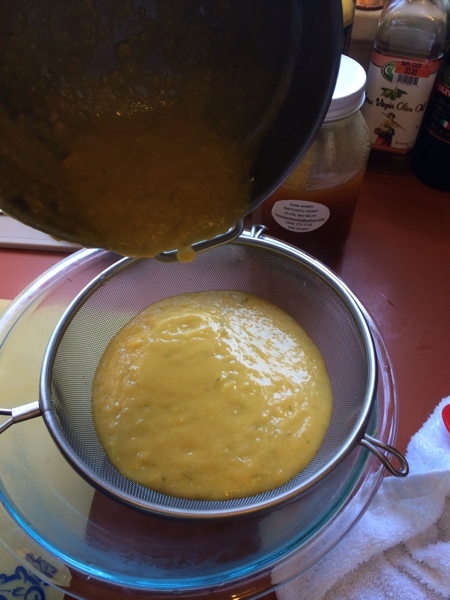 Remove the base mix from the fridge and transfer to a single mesh strainer. Run cold water over and through the mix, using your hand to make sure that the salt solution is rinsed off. fine dice the olives, peel, trim and mince the garlic. 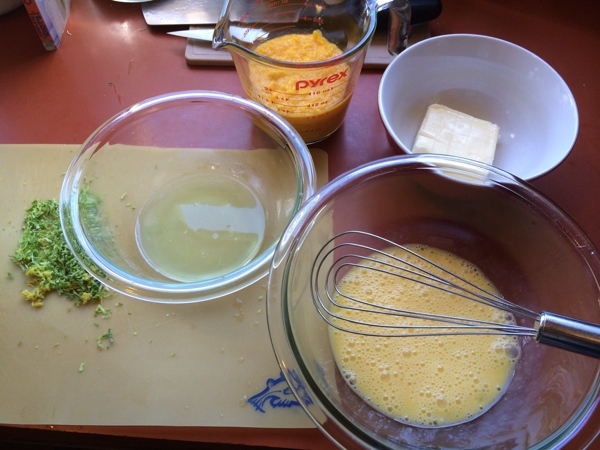 Add all ingredients to a glass or stainless mixing bowl and stir with a slotted spoon to thoroughly incorporate. Sanitize two quart mason jars either by boiling the jars, rings, and lids for 3-5 minutes in clean, fresh water, or running them through a cycle in your dishwasher. Transfer the mix to the jars, and seal. Refrigerate for two days prior to use. 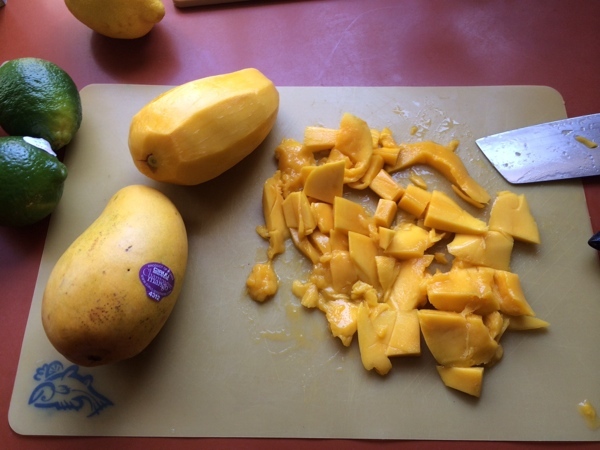 For the bite sized version, cut everything into roughly 1″ pieces, )or larger, depending on jar size and predilection), and process as per above. A bay leaf or two is a nice addition. Check out the latest edition of American Boomer – Love seeing our work done up so nicely! But wait, there’s more! It’s a double whammy, so have a look at the Summer edition as well. Two great treatments in one swell foop. As always, big thanks to Alexandra and the Greek! Posted on May 26, 2016 May 27, 2016 Author UrbanMoniqueCategories Boomer Magazine, Shameless Promotion Department, Vegetarian & Vegan, Y'all Share!Tags american boomerLeave a comment on Boom, we’re in print! Rather than write a piece on this, I’ll just steer you to Russ Parsons’ excellent L. A. Times piece on the subject, brought to our attention by alert reader Christy Hohman Cain. I own and regularly consult my Diane Kennedy Cuisines of Mexico book; I’ve followed her no soak advice for some time now, with excellent results. But when I read the bake your beans covered in the oven idea, the lightbulb got real bright – that’s sheer brilliance, and I’m all over it! If you love pickles like we do, you’ve pretty much always got several jars in your fridge. In addition to cukes, we’ll typically have store bought capers, olives, and pepperoncini. 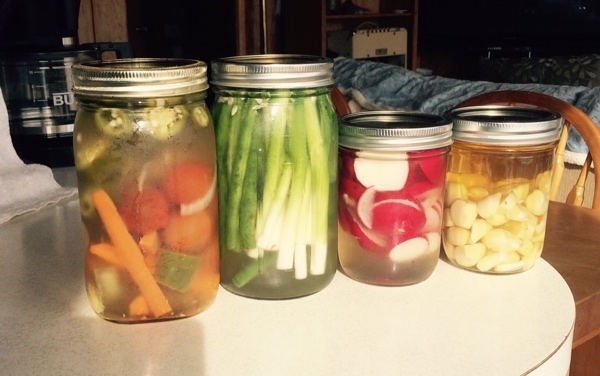 That list is a great source for fridge pickling brine you can now add to carrots, chiles, green onions, green beans, radishes, garlic, and whatever else strikes your fancy. Got a favorite brand with a just right pickle flavor? 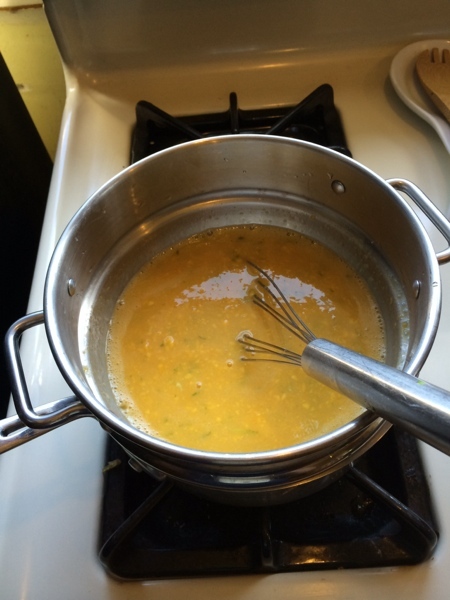 Save that brine and jar, and replace those kosher dills with a mix of jalapeno, garlic, onions and carrots. Top things off with fresh vinegar if needed, and you can add additional pickling spices as well if you like. 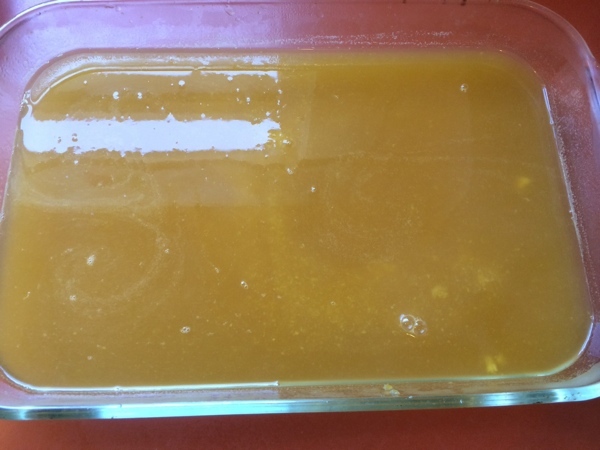 Allow your new batch to marinate for 2 or 3 days, and you’re back in business. Fridge pickled goodies will last a month or two, although they’re so good, they’re unlikely to survive that long. Try something a bit outside the box, like pearl onions in leftover caper brine, or cherry tomatoes in pepperoncini brine; experimentation is bound to lead to fresh ideas and new favorites. Let that outside the box thinking color your spice selection as well. Here’s the perfect chance to experiment with a single jar; develop something you love and you can expand to a batch run later. In addition to providing wonderful treats for a Bloody Mary or martini, pickled veggies add great zing to everything from salads or omelettes to soups and stews. Next time you’re in the produce aisle, see what looks good and grab a little extra to pickle with. As always, carefully inspect and chose top quality for this endeavor. Try something that maybe you think you don’t like or aren’t that familiar with, like Bok Choi, Fennel, or turnips. A quick pickle brings a very tasty note to an otherwise dull character; try pickled celery and you’ll see what I mean. 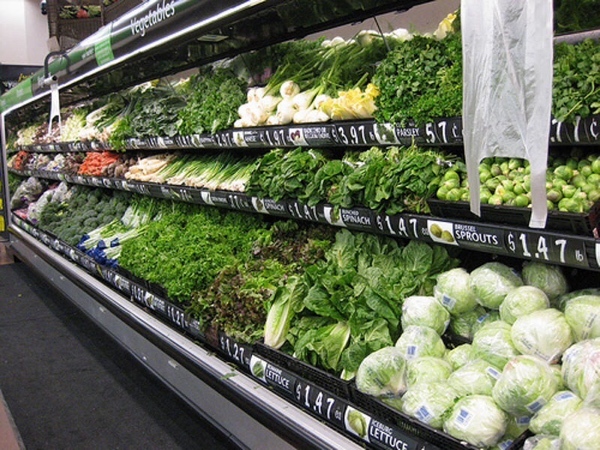 Once you’re home, thoroughly rinse your produce in clean, cold water. For radishes, carrots, chiles, green and sweet onions and cukes, top, skin, seed, core, etc, and then cut them into whatever form you prefer your pickles in. Fo green beans, corn, or peas, a quick blanch and shock will help preserve texture and color. Bring a large pot of well salted water to a rolling boil, and have an ice bath standing by that, (50%-50% ice and water). Toss your veggies into the boiling water for about 30 seconds, the transfer them with a slotted spoon and plunge them into the ice bath. Leave them there until they’ve cooled completely. Remove and you’re ready to pickle. When you’re ready to pickle, pour the remaining brine into a clean bowl or pitcher. Wash your jars thoroughly, and either sterilize them in your blanching bath, or run them through your dishwasher. Do the same with lids and rings. For whatever you prepare, make sure they’re well packed, with at least an inch of brine above the tops of the contents, and seal the jars well. 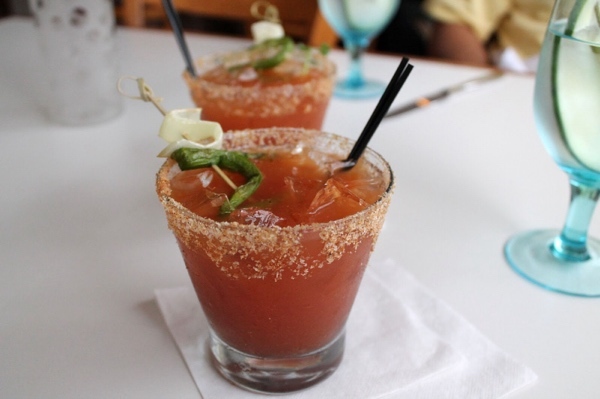 Oh, and don’t forget to dust the rim of your Bloody Mary glass with chile salt. Posted on November 2, 2014 Author urbanmoniqueCategories Basics & Process, Duh! Cooking Thought of the Day, Preserving, Salads and Sides, Spice, Seasoning, Etc, Uncategorized, Vegetarian & VeganTags fridge pickle, pickle2 Comments on We can pickle that! 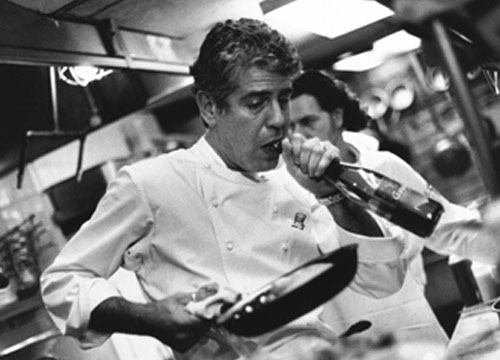 Anthony Bourdain hates your garlic press. In his epic tell all, Kitchen Confidential, my favorite kitchen kermudgeon, Anthony Bourdain, had this to say about garlic. Is he over the top? I’d say 90% yes, but let’s just break down his specific contentions to be sure, shall we? First off, we have the implied divinity of garlic: Is he right? 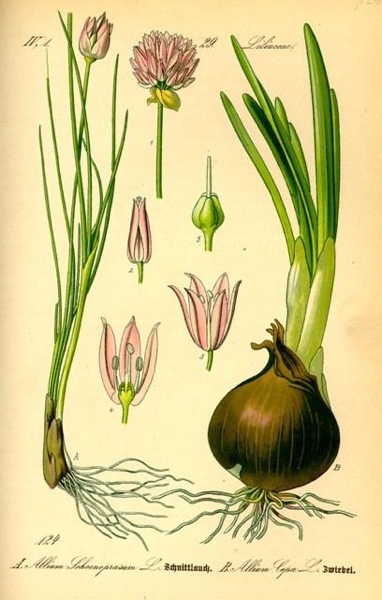 Allium Sativum, of the Family Rosacea, (why it’s sometimes called ‘the stinking rose), is indeed magic, and its broad, utilitarian beauty is admirable. No other veggie has that ethereal combination of bite, heat, and sweet that garlic packs. What the author doesn’t note is that all garlic is not created equal. There are hundreds of cultivated garlic varieties worldwide, which is great if you’re a gardener or know a generous one. If you have a green thumb and your cultivation zone can handle it, by all means grow it. 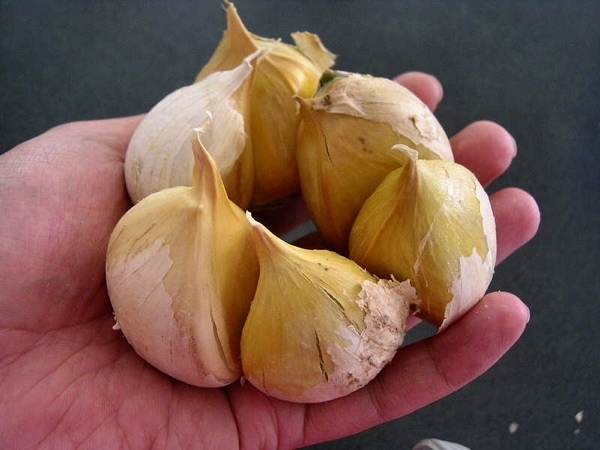 Just Google ‘Heirloom garlic starts’ and you’ll find a veritable cornucopia of options. Otherwise, hit up your local farmers market or CSA and load up when the magic is in season. 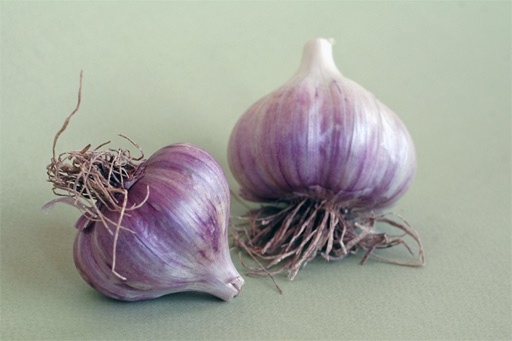 Great garlic is usually not available year round to the vast majority of us. As such, some plan for preservation is in order. Drying is your best bet; while there is a certain loss of flavor, it’s a given that great garlic dried will be better than OK garlic fresh, so it’s worth the effort. You should peel the cloves, and at the least, cut ’em in half, though you can chop or mince if you like; process in a dehydrator or warm oven until they’re light and dry to the feel. Please know that garlic in oil is not a safe methodology; garlic is a low acid food, and you’re begging for botulism here. 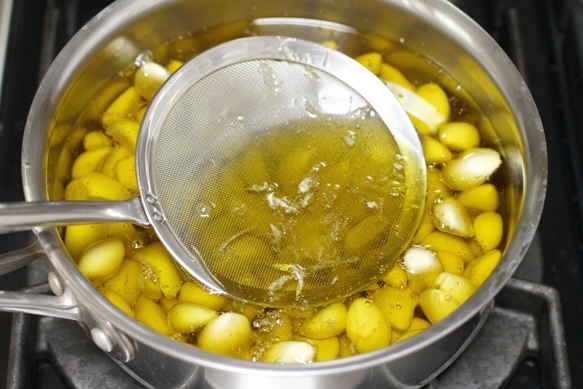 Making garlic oil in small batches and freezing it is A-OK. Puree your garlic, mix it with good olive oil, strain it through cheese cloth or a fine, double sieve. This is another perfect ice cube tray application – freeze it that way and pop a cube out for use. You can and should pickle garlic, it’s delightful and has a complexity like no other. Finally, garlic salt or pepper are nice options as well. Kosher or sea salt both work fine, though the uniform grain of kosher probably works best; for garlic pepper, use whole black tellicherry berries. 1/4 cup of garlic for each cup of salt or pepper will do the trick. Preheat your oven to warm, or 180° F, and line a baking sheet with parchment paper. 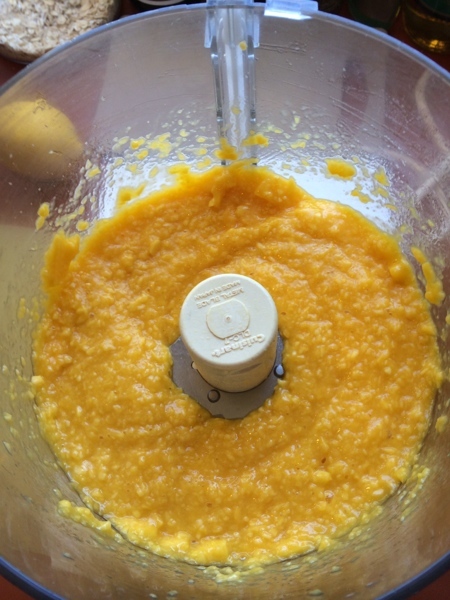 Peel the garlic cloves, then add them straight away with the salt or pepper to a food processor. Process for about 30 seconds, until you’ve got a uniform texture. Spread the results into an even, thin layer on your baking sheet. Bake for about an hour, until the results are crisp and dry. You do not want them to brown, so keep an eye on things. Transfer the salt or pepper back to the processor using the parchment. Pulse a few times to break things up to an even consistency. Stored in airtight glass jars, your housemade lovelies are good to go for 3 or 4 months. If the grocery is your only option, then what you’re likely to find will break down into three varieties; Softneck, Hardneck, and Elephant. Softneck Garlic is the most common variety you’ll find; this is the fat, white head of multiple cloves with several layers of papery, thin skin surrounding that you can score for roughly .50¢ a pop. It’s also the easiest variety to grow in a backyard garden. Softneck garlic has a fairly strong garlic bite and a sweet, pungent odor. Most garlic heads that have been braided together are softneck varieties. Common Softneck varieties include California Early, California Late and Creole. Hardneck Garlic is a bit less common, but still can be found in grocery stores. Hardneck features lovely shades of purple through brown, with thin skins and larger and fewer cloves than the softneck stuff. These varieties are generally somewhat stronger in flavor and scent than the soft stuff, and they generally don’t store as well, so it’s prudent to use them quickly after you buy. Commonly found Hardneck varieties include German Extra Hearty and Roja. Elephant Garlic is the third variant you’re likely to find. It features a big ol’ head of very large cloves that can approach shallots in size. Prized for its subtle, mild flavor and scent, elephant garlic is great for folks who don’t like their garlic too assertive. Onward! Bourdain’s next claim is that garlic “can taste so many distinct ways, handled correctly,” and that “misuse of garlic is a crime;” he is spot on here, though there are a couple of critical points left unstated. First off, what the artist formerly known as Chef doesn’t say is this; more than how you prep it, the most important caveat for “correct” is how much garlic to use. 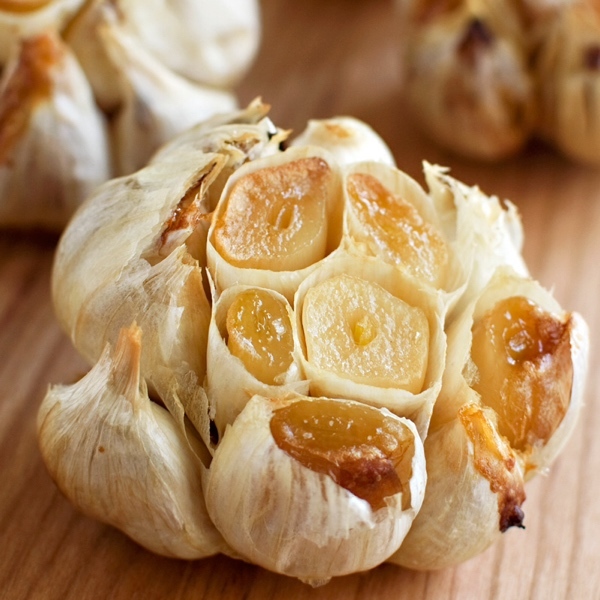 Garlic is by nature potent, and this is why so many cooks over-season with it. Too much can bring out the negative aspects of its character every bit as much as improper cooking can. My simple rule is this: If the dish you’re making has garlic in the title, then you should use enough to bring it to the forefront of the flavor profile. When this is the case, do consider what form you’re going to use the garlic in. Let’s say you’re making garlic lamb or chicken; whole, peeled cloves added to a brine or marinade, or braised or roasted with the protein will deliver a lot of garlic flavor without blowing your socks off. 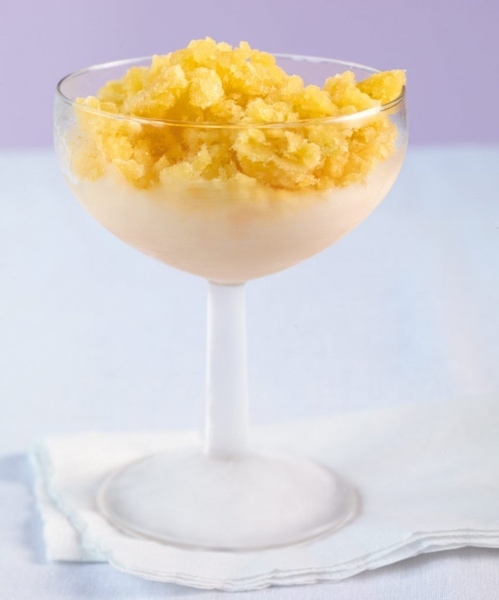 Fewer cloves minced, diced, or crushed can be every bit as potent or more so than whole peeled cloves. If garlic is not in a lead role, err to the side of caution and use less than you think you should. Let’s take chili for example – Garlic belongs here, but not as a dominant note. You’re after the subtle, sweet mouth feel a little garlic adds to a dish like this, so a moderate sized clove, one clove, will do for a whole pot of chili. That’s what I mean by subtle use; folks won’t even necessarily know garlic is there, but it will add that certain je ne sais quoi nonetheless. Consider adding peeled, whole cloves to soups, stews, and low and slow braised or roasted dishes; that’ll impart a nice, subtle background flavor, and some lucky diner gets to find a treat as well. Next comes old garlic, and that is indeed a crime of epic proportion. Add to this, sub-par garlic. Since in large part we’re talking about gathering here, (AKA, shopping), then with whichever variety you’re hunting, do your due diligence. Choose firm, uniform heads with no soft spots, off colors, or smells. 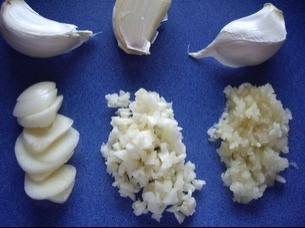 You should squeeze and scrutinize garlic as you would any other veggie you pay good money for. Then there’s the storage thing. I’ll just tell ya straight up that garlic does not belong in the fridge, ’cause that will encourage sprouting, which leads pretty quickly to off flavors. 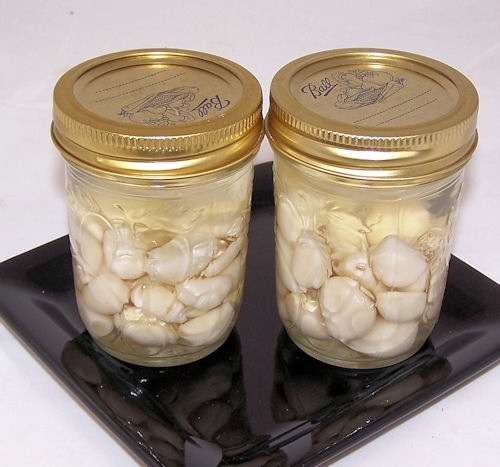 Keep your garlic in a well ventilated, dry container, out of strong, direct sunlight. Garlic will last a month or two so stored, but as cheap as it is, you’re best served to buy a small head at a time and use it promptly. When you’re ready to use the stuff, fresh garlic cloves should be firm and creamy white in color; if they’re yellowish, have brown spots, and/or are starting to sprout, toss it. That stuff will have a hot, bitter taste that is quite off-putting. Burnt garlic comes next, and should we even have to say no to that? Actually, we do, because it happens far too often. Burnt garlic brings out the worst in this heavenly stuff, turning complex, sweet and pungent to bitter, sour, and overpowering. It will overwhelm everything else in a dish in a New York minute. Understanding how and why garlic burns is the key to avoiding this mess. Throwing garlic into a dish too soon often leads to burning: In a little oil in a saucepan over medium high heat, any form of processed garlic can and will burn within a minute or two at most; that’s why it should always be the last thing you add. Longer cooking under any kind of high heat will make garlic taste bitter, even if you don’t burn it. Smashing, pressing, mincing, dicing, and slicing garlic releases more flavor than cooking with whole cloves, but it also makes for a bunch more surface area that can potentially burn. For the former, he’s right on the money. 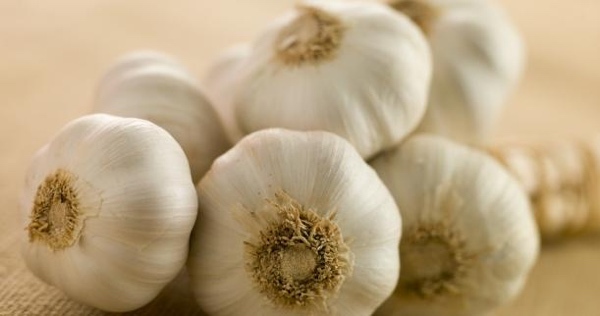 The longer garlic sits after being cut, the more the essential oils and compounds that make it great begin to break down into other, much less desirable constituents. Ideally, it should be prepped 5 to 10 minutes prior to cooking with it; this little rest helps stabilizes the garlic, making it more resistant to heat. As to the latter, I respectfully disagree. Pressed garlic is no more a crime than puréed, smashed, or minced. Furthermore, there not only is a place for all these variants in cooking, they may actually be good for us. Garlic contains a sulfoxide derivative of the amino acid cysteine, called Alliin, as well as a catalyzing enzyme, Alliinase. In a whole clove, these constituents remain separated within the cell structure. 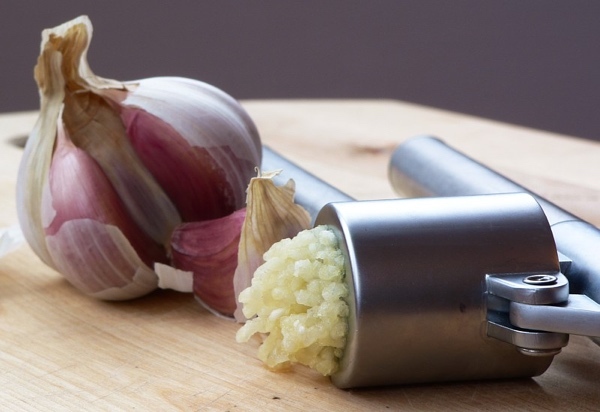 Slicing, chopping, mincing or pressing garlic ruptures the cells, releasing these elements to combine and form a new compound, Alliicin, the primary biologically active compound within garlic. 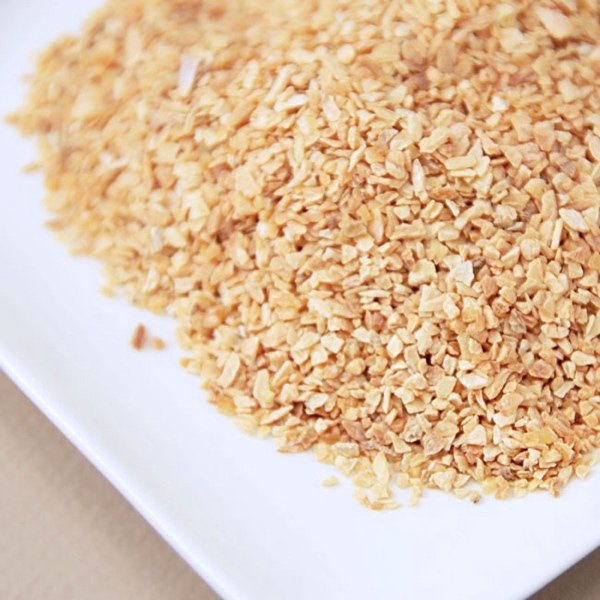 Alliisin is garlic’s defense mechanism, released to ward of pests in the natural world. It is responsible for the pungent aroma, as well as the bite/heat/power of the stuff. Alliicin has known anti-fungal and anti-bacterial properties, and may aid in the reduction of atherosclerosis, decrease blood pressure, and provide anti-inflammatory properties as well. In short, sorry Tony, but chopping, mashing and yes, even pressing garlic finely, produces more Alliisin, and coincidentally, provides the strongest garlic bang for the buck. He goes on to vilify any form of processed garlic sold in a jar, and for the most part, he’s right. That stuff is far from fresh, and whatever methods are used to shelf stabilize it aren’t anything you should be hankering for. Next, Bourdain encourages us all to enjoy roast garlic, and upon this there can be nothing negative said. Roast garlic is indeed food of the gods, and here’s how you do it. Preheat your oven to 400° F and place a rack dead in the middle. Prep whole heads of garlic by removing the thicker outer papery layers. Leave the skins on the individual cloves and carefully remove about the top 1/4″ of each, exposing the cloves. Drizzle a little extra virgin olive oil in each clove, then loosely cover them with aluminum foil. Roast for about 30 minutes until the tops of each clove is golden brown and they’re soft to the touch. Allow the cloves to cool until handleable. Use a small fork or knife to extract the soft garlic and spread it onto fresh, crusty bread. Welcome to Heaven. If roasted garlic is heaven, confit garlic is Valhalla. Peel a few heads of garlic down to whole cloves. In a small sauce pan over medium low heat, heat extra virgin olive oil through, then add the garlic, making sure all the cloves are fully submerged. Heat slowly but thoroughly for about an hour, until the cloves are soft. Keep the heat low so that the garlic doesn’t brown. Serve spread onto fresh, crusty bread with a nice glass of red. And on that final note, we disagree completely. As I mentioned before, great garlic dried is really good garlic, especially if you made it at home. Posted on October 26, 2014 Author urbanmoniqueCategories Basics & Process, Classics & Standards, Growing Your Own, Preserving, Reference, Spice, Seasoning, Etc, Uncategorized, Vegetarian & VeganTags anthony bourdain, garlic6 Comments on Anthony Bourdain hates your garlic press. We’ve got pals coming over tonight for dinner and some guitar playing. We’ll be doing a nice surf and turf with grilled Angus beef and butter poached true cod; for stuff that rich, you really need a refreshing salad that’ll cut through the fairly hefty proteins. This simple version is a long time fave of ours. The shallot, arugula, and garlic chives are a bit outside the box, and a real delight as well. If you can’t find fresh garlic chives, grow some; they’re easy to raise in a window box herb garden and go wonderfully with lots of stuff. Peel, seed and thinly slice the cucumbers. Core, seed and dice the tomatoes. Mince the shallot, and chiffenade the garlic chives. 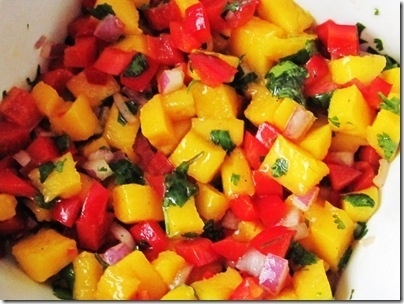 Combine all the dressing ingredients, and allow to rest for 15 minutes. 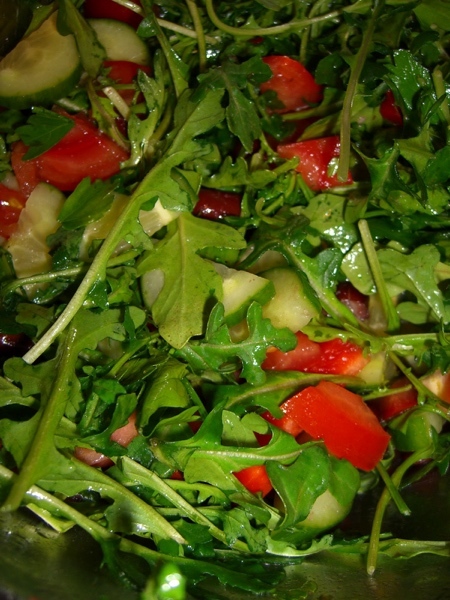 Combine all salad ingredients in a non-reactive bowl and toss to thoroughly coat veggies; allow the salad to rest, refrigerated, for 30 minutes.